On the rocky moon of Iktotch, Cael Dan’kor is born into a primitive yet honorable family. His father, Cael Dan’kor the first, spends his life as a cartographer. Iktotch is a mountainous, windy, and arid place, where most live a simple life without technology. Cael’s father’s maps are heavily relied upon to travel from village to village. It is almost impossible to navigate the moon’s surface without the “Dan’kor map”. At the age of seven, Jedi Master Gor Elkee, an elderly Iktotchi and Watchman of the Narvath sector, finds and identifies him as Force-sensitive. Reluctantly his father is convinced to give the Iktotchi youth over to the Jedi. Cael leaves the planet to be reviewed by the Jedi High Council on Coruscant. At the age of eight, Cael Dan’kor is initiated by the High Council. Not long after Cael first communes with the Force, and awakens the ability to read minds and communicate with them. After a short trip to the library, Cael learns Iktotchi are innately gifted in precognition and believes telepathy to be an extension of that. The young, stubborn, overconfident, and headstrong Cael abuses the power to pass classes, win spars, and incite fights. Eventually he is brought before the High Council, who nearly exile and deploy him to the Jedi Educational Corp, but is ultimately vouched for by the Jedi who found him, Master Elkee. Master Elkee promises the High Council to teach Cael to control his gifts, and takes Cael as his apprentice. Gor Elkee, Jedi Watchman, trains the adolescent Cael mostly outside the Jedi Temple. Master Elkee teaches him the ways of the Force. From planet to planet, from sector to sector, Padawan Dan’kor understands and learns how to be a Jedi. His elderly mentor, Gor Elkee, is a very brash, daring Jedi, otherwise incapable of diplomacy. Cael very, very slowly becomes the opposite of Gor, in order for them to survive, he sarcastically figures. Nonetheless, training continues, and Cael gives Gor a rough time. His stubbornness and overconfidence are astounding. Despite Gor’s unruly disposition, the Jedi Master perceives the Force in an obscure manner. He explains the Force are two deities: Ashla the Light and Bogan the Dark. After further explanation, this odd way of thinking sits well with Cael, and he adheres to that perspective. It shed a new light on a man Cael thought he figured out. As they explore the Outer Rim, an older Cael and Gor establish an extreme bond, a Force bond, to which Cael considers Gor to be a second father. Cael’s flaws lessen in gravity, and his Jedi powers refine to an adequate degree of an aspiring Jedi Knight as he matures. At the age of twenty-three, to the complete surprise of Cael, the pair returns to the Coruscant Temple, where the young man undergoes his Jedi trials. Cael succeeds, and is granted the rank of Jedi Knight by the High Council. The very next day Gor Elkee is sent on a covert mission in Wild Space by the High Council. During the course of the mission, Master Elkee goes missing. The High Council deploys a Jedi recovery team to retrieve the Jedi Master. When found, a Jedi Healer deduces Master Elkee has obtained an unknown illness, and is held at a hazard center, as Healers attempt to figure out a resolution. Cael is shaken to the very core, and not satisfied with playing spectator. It inspires him to seek training as a Jedi Healer at the Arkanian Praxeum, to find a solution to cure Gor. Sadly, while Cael is studying at the Praxeum, he is alerted Gor Elkee becomes one with “Ashla” overnight. He grimly returns the hazard center to find his deceased “second father”. A pyre burning is held in his honor. People and Jedi across the galaxy attend the funeral out of respect to the Jedi Master, who helped so many in his lifetime. Cael has little desire to travel after that, and notifies the Arkanian Praxeum he will not return to complete his training as a Jedi Healer. He spends the next several decades training aspiring Jedi at the Coruscant Temple. Now in his early forties, Cael, who was taught by Master Elkee to follow his instincts, transfers to the Yavin Temple, in service to Ashla’s will. 297.03 ABY – Cael Dan’kor is born on Iktotch. 305.08 ABY – Cael Dan’kor is initiated. 308.15 ABY – Cael Dan’kor is apprenticed to Gor Elkee*. 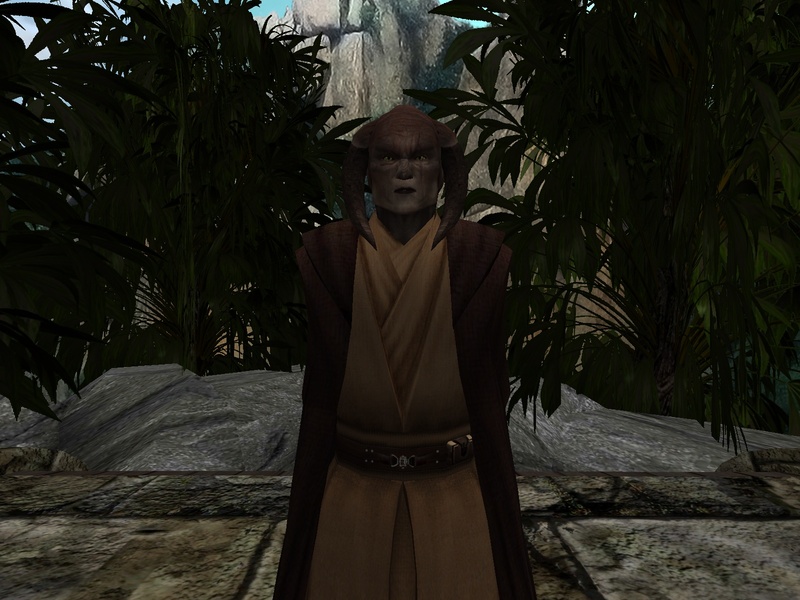 320.01 ABY – Cael Dan’kor is granted the rank of Jedi Knight. 322.13 ABY – Gor Elkee* dies. 336.20 ABY – Cael Dan’kor transfers to the Yavin Temple. 340.21 ABY – Cael Dan’kor is granted a seat on the Rannon Council. 340.27 ABY – Kro’jan Touru is apprenticed to Cael Dan’kor. 341.26 ABY – Cael Dan’kor is granted the rank of Jedi Master. 350.26 ABY – Cael Dan’kor is granted a seat on the High Council. 354.09 ABY – Kro’jan Touru departs the Rannon Praxeum. 354.24 ABY – Karmarie Zar is granted the rank of Jedi Knight. 358.12 ABY – Cal Enesic is apprenticed to Cael Dan’kor. 359.15 ABY – Kro’jan Touru returns to the Rannon Praxeum as Cael Dan’kor’s apprentice. 365.01 ABY – Cael Dan’kor retires. 366.27 ABY – Kro’jan Touru departs the Rannon Praxeum. 369.23 ABY – Cael Dan’kor returns to active duty. 370.18 ABY – Heron Liagri is apprenticed to Cael Dan’kor. 371.04 ABY – Cael Dan’kor is granted a seat on the Rannon Council. 371.11 ABY – Levi Astra is apprenticed to Cael Dan’kor. 375.27 ABY – Cael Dan’kor is granted a seat on the High Council. 378.22 ABY – Heron Liagri and Levi Astra are granted the rank of Jedi Knight. 379.06 ABY – Cael Dan’kor steps down from the High Council.